Following the successful launch across Steam, PlayStation 4, Nintendo Switch and Xbox One (including Microsoft’s Game Pass subscription service!) 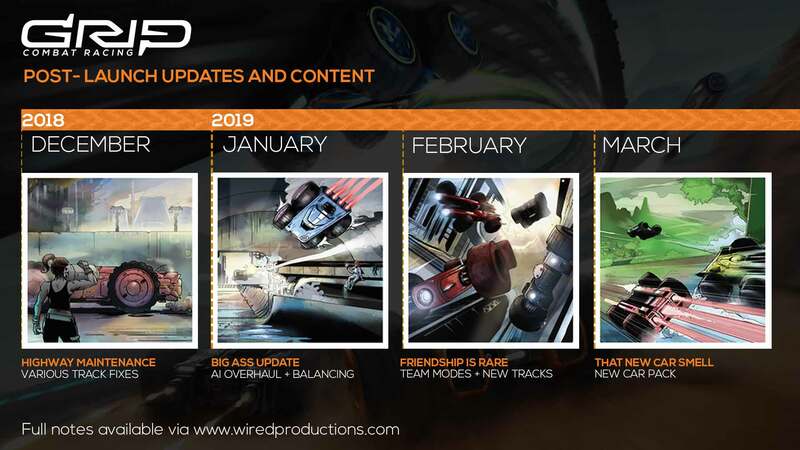 we've unveiled the timeline for future content (and fixes) to showcases a variety of upcoming developments, from game balancing enhancements through to all new tracks and modes, all engineered to ensure GRIP: Combat Racing remains a competitive and engaging experience! Fixed hole in second tunnel on track LIT. You've asked for it! Team Modes are coming! Hit the arena or track with your crew and battle it out on the leaderboards! Three new cars are currently in design, along with something special racers from the 90's will enjoy! Xbox and Playstation get GRIP update! Sparks Fly as Release Date for Tesla-Inspired Horror Adventure, Close to the Sun is revealed!